I was in New York this past week and ate at the most FAMOUS & BEST spots in the city. Of course, being in NYC for a week, I had to go to a deli. Not just any deli, but I wanted to go to the best. 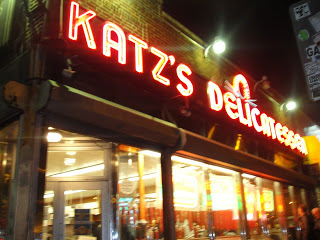 I saw Katz’s deli on the Travel Channel awhile ago and have been wanting to go there ever since. It is rated one of NYC’s best deli’s. It is famous for their pastrami. This delicatessan has been known and famous since 1888 and is located on the lower east side. This place has so much history, and the walls are covered with pictures of major celebrities that have eaten at Katz’s. If you want a real authentic deli that isn’t swarmed with tourists, Katz’s is where it’s at. Like I said Katz’s deli is famous for their pastrami. The pastrami is cooked for 24 hours. My sandwich had no fatty meat, you could tell it was a good cut of meat. The kitchen wheels the pastrami out on carts and slice it in front of you as you order it too! The pastrami slices are thicker than I was used to, but it’s quality meat and has a lot of flavor. This place is definitely a landmark in Manhatten. I highly recommend this place even if it’s just for the experience! This place has been on my list of places to go in downtown Manhattan since forever and you’ve just given me the motivation to get up and actually go. I will definitely try the pastrami now.